Usually heard first, or a black bird with a prominent red or orange patch on the tail is seen flying. Usually visits campus when the bloodwoods (Corymbia spp.) are fruiting extracting the seeds from the capsules. The tail band is red in the male but in female the orange band has yellow and black bars. 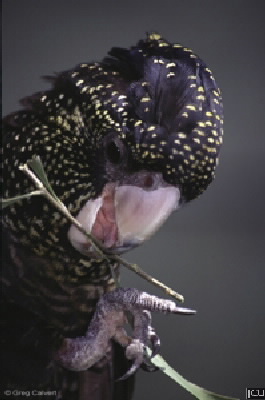 There are numerous yellowish spots on the head in the female. Legs and feet greyish brown, eyes dark brown, bill blackish in male, white in female.